November 7, 2010, Lisa and Don checked in their Yankee #98. They have come back to the pod, buying Warren Levine's #98, and for the second time trailed a Dolphin 24 from the San Francisco Bay area to their lake in the Rockies of northwest Montana. 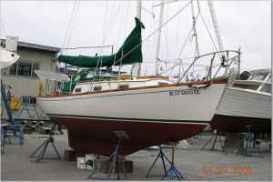 They were past owners of Fanny, Yankee #107 which they sold a few years ago to a couple who also sail on Flathead Lake in Montana. Below are photos of #98 from the Craigslist ad. Here is their email, edited. We bought Hull # 107 in December, 1998 from a brokerage in the Bay Area (SF Bay). We trailored Delphino (?) to Somers, MT on one of the coldest days of that winter. I am sure she was wondering "what on earth is all this white stuff on the ground!" 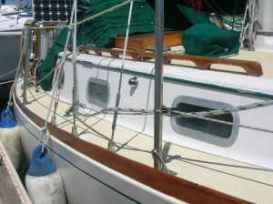 When we saw Warren Levine's boat for sail (Hull # 98) Don went out to Sausalito where it was kept and it was love at first sight . She doesn't have a name yet, and hasn't yet dipped her keel in freshwater, but is happily housed on our property in Somers, anticipating warmer weather in about 6 months and her first sail on Flathead Lake. I might also add we may not be done cruising in either MX or the San Juans and North. We were inspired to read of the plans for cruising by another Dolphin owner who spoke of both MX and the Pacific Northwest. 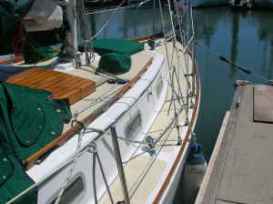 Bullet proof, Pocket cruiser as handsome a 24' sailboat as you will ever see. 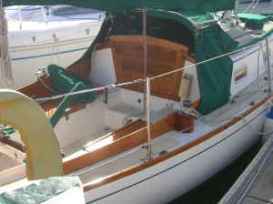 S&S design, full (lead) keel, teak trim, draft 2'10", with centerboard 5'2", 1650 ballast displacement of 4250. She's ready to sail. Head, covers, heater and lots more. Looking to sell this spring will negotiate. October 30, 2009. We tracked down Warren Levine who advised that #98 was sold this summer to a buyer who took her to Montana. He also said that the buyer had previously owned a Dolphin.....Stay tuned. November 5, 2010. Deb Davis, Yankee #107, Flathead Lake Montana, advised that #98 has arrived in Montana, and there will now be 2 Dolphins on the lake! The new owners of #98 were formers owners of #107. We hope to hear from them soon. Stay tuned.